We have found that it is useful to notice what we're thinking, what body reactions we have, our emotions and the way we react behaviourally at times when we are feeling upset. 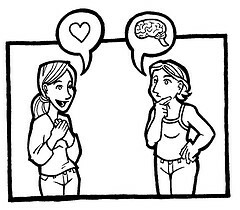 When communicating with other people, it helps to keep in mind not only what you are experiencing (thoughts, feelings, behaviours) but also what they might be experiencing, which might be similar, different, or completely opposite to your experience (and anywhere in-between!). Just because you believe they are thinking something - maybe about you - that doesn't necessarily make it true - our minds are continually trying to make sense of our world, but our minds do not always get it right. Our thoughts and emotions can get in the way of effective communication, and we can end up making things worse and messing things up. This awareness of our own reactions, together with an understanding and awareness of how the other person might be reacting (their thoughts, feelings and responses) will give us important knowledge and help us to respond in a more helpful and effective way. It is so easy to get things wrong and misunderstand what the other person is saying. W tend to react to what we think they mean, they react to what they think we mean, and so it goes on. We can learn to be more assertive and effective in communicating what we really want to say, without upsetting the other person, and reduce misunderstandings on both sides. The aim is to practice behaving and communicating more assertively, and to reduce acting and communicating in passive and aggressive ways, which usually result in distress. It can help to think about a person who you respect and who you believe acts and communicates effectively and assertively, respecting others and themselves, who is warm and friendly. This can be a person who is known personally to you, or a famous person, or perhaps a fictional character. You can model yourself on that person - imagine them dealing with particular situations and how they would do it, what that would look like. Then imagine yourself acting in a similar way. Then do it. Practice it often. Initially, it doesn't matter if you don't feel like being assertive, just practice it anyway. When you notice yourself acting aggressively or passively, just notice, then change your posture, expression and behaviour to as though you were being assertive. It works! Go to the next page to learn more about being assertive.